John C Coonley Elementary School was built during the World's Columbian Exposition, the historic Chicago World’s Fair of 1892, which opened to the public May 1, 1893 and continued until October 30, 1893. Originally Belle Plaine Avenue School, in 1901 the name was changed to Coonley after John C. Coonley (1838-1882), a Chicago businessman born near Utica, NY. In the last year of his life he served as president of the Union League Club, a Chicago institution he helped found. The school's original wooden structure was torn down and replaced by today's brick and stone building in 1902. Additions to the school were built in 1906 and 1957. In 1970, low-pressure steam boilers were installed to replace high-pressure, hand-fired coal boilers that heated the school since 1924. 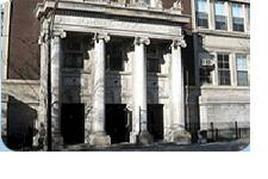 A comprehensive renovation of the school building and grounds was completed in 2008-2009 with $3.75 million provided by Chicago Public Schools and the Federal government. Money raised by Coonley parent and community organizations in recent years have funded a new science center and library improvements in addition to numerous programs. In the fall of 2010 a capital campaign raised over $35,000 to be used for enhancing facilities in the multi-use gymnasium. Tribune front page from the July 15, 1892 edition, in which the article appeared. 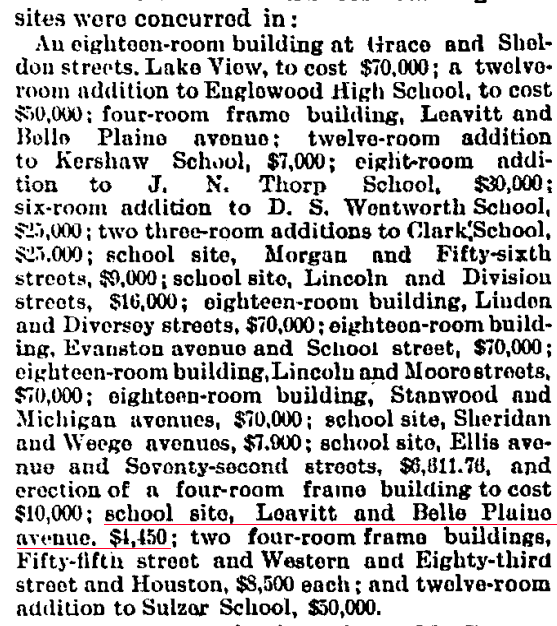 The news story at left, published in the Tribune's September 11, 1904 edition and headlined, “Flower Gardens in School Yards,” reports that 250 Chicago public school principals agreed to get the “schoolboys and the schoolgirls to help them shovel, and hoe, and plant,” asking the school board only for black dirt and to remove the bricks covering their school yards. 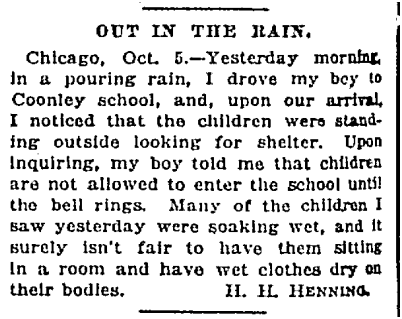 Letter to the editor of the Tribune published Oct. 8, 1926. May 21, 1937: A unique tree on the Coonley grounds was featured in the Tribune (below left). The article mentions an incident over a weekend the year before in which falling plaster in a classroom wrecked a piano. 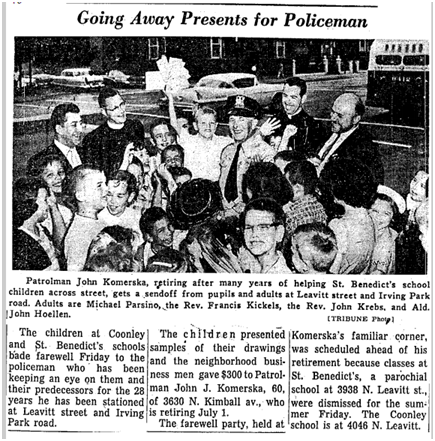 The Tribune ran several stories through the years about a beat officer, John J. Komerska or “Johnny the Cop” as he was known in the neighborhood, who for decades helped school children near Irving Park Road at Leavitt on their way to and from school at Coonley and St. Ben's. In 1952 and 1956 the officer was transferred as part of routine assignment rotations but returned both times to his old beat after school children besieged the police commissioner with petitions in protest. The story reproduced above, from the Tribune’s June 6, 1959 edition, describes a farewell party attended by church priests, students, and the alderman, the week before his retirement from the police department. 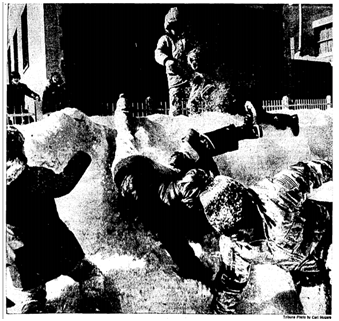 A newspaper photo of kids playing outside Coonley during the aftermath of the large winter storm that buried Chicago in snow in January 1978. 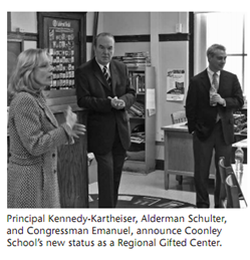 In 2008 Principal Kartheiser announced that, with the support of CPS and local representatives, the city’s newest Regional Gifted Center was to be located at Coonley. In November 2010 Rahm Emanuel affirmed his association with the school by announcing his mayoral candidacy to media and 250 supporters in Coonley's gym.